Edited by Neal O. Hammon. Hardbound, 176 pages, 6" x 9". In an 1851 visit with Boone's youngest son, Lyman Draper produced over three hundred pages of notes that became the most important source of information about Daniel Boone. The interviews provided a wealth of accurate, first-hand information concerning Boone's years in Kentucky, his capture by Indians, his defense of Fort Boonesboro, his lengthy hunting expeditions, and his final years in Missouri. 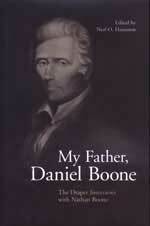 My Father, Daniel Boone is an engaging account of one of America's great pioneers, in which Nathan makes a point of separating fact from fiction. From explaining the methods his father used to track game to detailing how land speculation and legal problem from title claims caused Boone to leave Kentucky and take up residence farther west. This book brings a crucial period in frontier history to life.